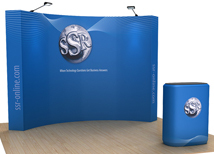 Quick Set pop up displays are the most portable and easy to assemble trade show booths available. They are comprised of an aluminum frame and a dye sublimation fabric graphic. The graphic stay attached to the frame at all times so set up is literally less than 5 minutes! The graphic is printed with a full color printer and is very durable and colorful. We offer two different lines of quick set pop up displays. The first is the OneFabric display which is product that utilizes a fabric graphic printed in China which makes this display system very affordable. The premium Hop Up Displays uses a stronger and more durable aluminum frame with a US printed graphic. There are many sizes available in both lines and every size is available in a straight or curved model! 3-D pop up displays are the newest addition to the industry. Stretch graphics and unique styling make these displays a step above a standard pop up. Easy assembly and low prices make these displays a great option. 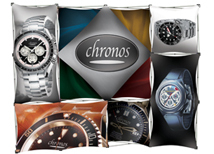 The OneFabric display is a great product manufactured by Brandstand America. 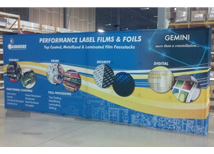 This display uses a dye sublimation fabric graphic that is printed in China for maximum cost savings. Although the graphic comes from an overseas printer it is still very high quality and turnaround time is only 5 business days. Hop Up displays are manufactured by Orbus Company and use a heavy duty aluminum frame and a US printed graphic. The frame has a lifetime warranty against defects and is designed to last for years of heavy duty trade show use. There are many sizes available and custom sizes can be made upon request!